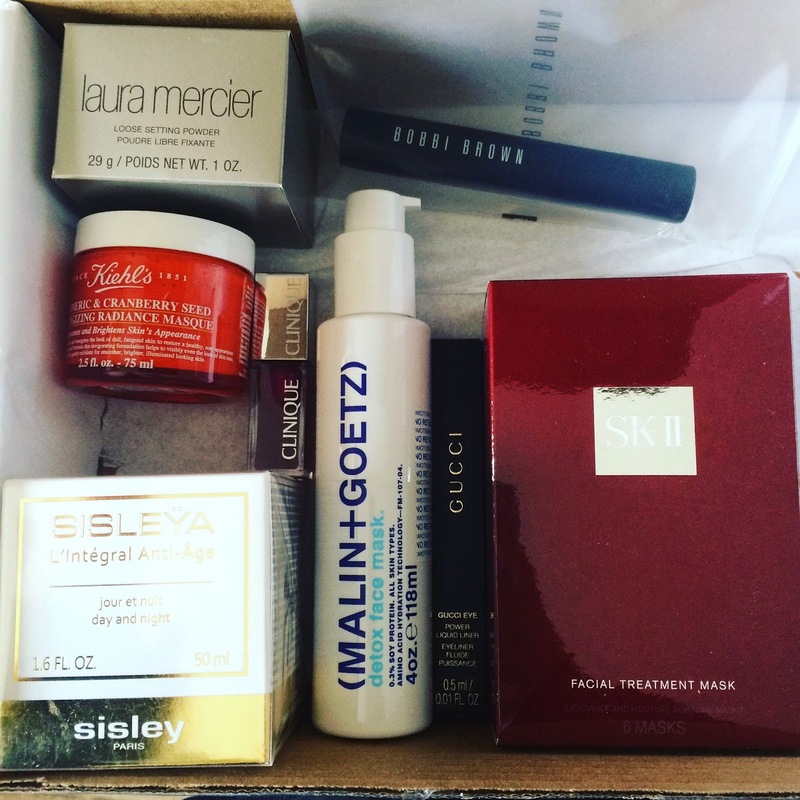 Four times a year Rakuten Affiliate Network chooses a select number of beauty bloggers to receive an exclusive box filled with goodies that showcase other brands in their network. I've received two of these boxes before, but this time we received a store-specific box - curated for Rakuten by Bloomingdale's! There were 25 of us that received this box, and I am over the moon excited to be able to share these amazing products with you. Today I'm going to show you what came in the box and give you my first impressions of all the products inside. Description: A subtle pop of dewy color for lips and cheeks. Our nourishing tint with safflower, jojoba and sunflower seed oils feels luscious yet lightweight. Fluid-gel formula slips on with ease thanks to a convenient wand applicator that delivers the perfect amount every time. Directions: Apply the tinted color on your cheeks and lips. Blend quickly with your fingertips. Performance: This color looks very bright in person, but it sheers out very nicely. By dapping it on with my fingertip I'm able to get a very natural glow on my skin and it doesn't feel oily either. Description: High-drama volume and high-impact curl in the blink of an eye. The jumbo brush fans and pushes lashes up and out, while the rich, carbon-black formula intensely thickens, curls and lifts lashes all day for the ultimate eye opening effect. The unique formula creates a long-lasting curl that holds for 8 hours. Performance: Mascara with a big brush always makes me nervous because I feel like I create a mess around my eye, and that it doesn't grab my lashes as well as a smaller brush can. Not only does this mascara have a nice black formula, but I was surprised when I noticed how much wider and awake my eyes looked after the first use. This effect doesn't last all day long, but it is very nice in the morning to have this added effect when you might be looking a little more groggy than usual. Description: Laura Mercier Loose Setting Powder contains the finest French "cashmere" talc, resulting in a sheer, silky powder that looks and feels natural. A unique light-reflecting ingredient creates a "soft-focus" appearance for fine lines and imperfections. Directions: Dip the velour powder in the powder and then massage the powder in the puff. Remove the excess by tapping the puff on top of your skin. Use a rolling motion to work the powder into your skin. Performance: My powder actually did not include a puff. So I'm not sure if the description I received was a misprint or if mine was just missing it upon production. I found this powder works well with a fluffy brush though! I tap a small amount into the cap and dip my brush in. After tapping off the excess I dap the brush onto my face and then blend once I'm finished. It does give a nice "blurring" effect to the skin. I also love that this powder has a screw-on top - it really eliminates any messes in the makeup mag or while traveling. Description: The Power Liquid Liner defines the eye with a clean line of saturated black color. The innovative nib applicator features a protected fiber core, designed for precise control and remarkable versatility. By combining the high intensity black pigment and the precision applicator, a dramatic long-lasting glossy finish is achieved. Waterproof for 12 hours and smudge-resistant. This is a quick-dry formula that dries down to a saturated glossy finish. Suitable for sensitive eyes and contact lens wearers. Directions: For a fool-proof cat-eye, start at the corner and apply inwards along the lash line. Rest the nib on the lashes to help reduce gaps. Performance: This is such a rich, black formula. The liner nib really is easy to work with and I find it to be very easy to control. It's not super fine, but I get a good thickness in a line when I use this that I usually try to achieve anyway, so this isn't an issue for me. However, I do not find this formula to be waterproof at all. It's smudge resistant in dry cases, but if your eye is damp it will smudge and smear. Description: Synthesizing complex amino acids and natural almond extract to gently and effectively purify, clarify and balance all skin types. Stable vitamin c, anti-oxidant vitamin e and soy protein help firm and address signs of aging. Oxygenating cleansing agents replace harsh detergents to deep cleanse and purify, lifting dirt, oil and makeup away from the skin, while creating a physical barrier to seal hydration. Natural fragrance and color. Easily integrated into daily maintenance and prevention regimen. Directions: For deep cleansing and hydration, use a thick layer of gel applied for 5 minutes or until dissipation of foam begins, in place of a cleanser, one to two times per week. Remove with warm wash cloth and water upon oxygenation. Tissue off without water upon oxygenation for optimal hydration. Performance: This mask has a light tan color and smells of sweet almonds. It has a lotion-like texture that is smooth and easy to spread onto the skin. Once applied it starts to bubble up with tiny little bubbles. I leave it on for about 10 minutes, then rinsed away. It leaves my skin feeling smooth and soft, and looking a little brighter too. I have not tried it with makeup, but it does make a good cleanser as well. Description: An instant facial mask that invigorates skin and brightens appearance in minutes. Recharge skin's youthful glow with this naturally invigorating, skin-energizing masque. Formulated with Cranberry Extract, an antioxidant packed superberry rich in resveratrol, and anti-inflamitory Tumeric Extract, this unique masque also contains micronized Cranberry seeds that can be used to gently exfolaite the skin while washing the masque off after use. Directions: A rinse-off formula to be used after cleansing and toning skin, allow mask to dry for 5-10 minutes. Recommended for daytime use. Performance: This mask has a bit of a minty, eucalyptus scent to it (which are both in the ingredients). It's super creamy - I love the texture! After massaging my face with those little cranberry seeds and rinsing the mask off my face really does seem brighter and a bit clearer. I've only used this mask once so far but I'm excited to see what it does with prolonged use. Description: A radiance and moisture-enhancing facial mask. This 100 percent cotton mask drenches the skin with pitera's fusion of vitamin, amino acids, minerals, and organic acids, while working to revitalize, comfort, and provide intense hydration. It immediately replenishes dehydrated skin, leaving it refreshed and cool. Interesting Fact: This product is one of the best sellers of the SK-II line. As a bridal skincare ritual, the Japanese like to soap Facial Treatment Masks everyday for more than 90 days prior to the wedding day. Performance: This mask is made from a super thick cotton sheet that is too stiff to stick well to my face. I had to pat it down in spots continually to get it to sit flush on top my skin. The essence was nice, soothing and hydrating. The mask lasted about 45 minutes before the material just got too itchy - and then, holy brightness! My skin was so white and bright afterwards! I also noticed after using this mask my skin becomes much softer to the touch. This seems like a great mask, but it needs to be made with softer material. Description: Powerful skin care with total anti-aging action: fights all the visible signs of generic aging and those linked to our environmental and lifestyle. Everyday stress, hardship and various excesses deregulate the biological life cycle of cells. This behavioral dimension, the third dimension of aging, affects the face even more than generic or environmental aging. Formulated with a complex of highly effective plant-based active ingredients. Spectacular results on wrinkles, firmness, radiance, density and hydration. Visibly diminishes perceived aging. Morning and evening. Performance: So after the "stress" of pushing myself to use a cream that costs almost as much as a month of rent, I am ashamed pleased to say that I really do love this cream, and I did before I noticed how much it costs. I should have read the card before use, but I didn't - I was sick and I missed it. A moisturizer that makes me look alive when I'm sick. A cream that soaks into my oily skin like nothing and keeps my skin hydrated and plump day and night. There is a minimal scent that I have a hard time placing - it seems pretty generic, but the formula is something that I've been searching for, and of course found in something I could never afford if it weren't for amazing sponsors like Rakuten and Bloomingdales. I don't have many aging concerns right now, but I am turning 30 in two months, so prevention is key for me, and this cream is going to be on every wish-list anyone asks from me for the rest of my life. Everything in this post can be found at Bloomingdale's!